Every year our nationwide survey asks how people feel about their most obsessed about possession – their homes. The Homeowners Survey 2015, polled by YouGov, gives a state of the nation report on the biggest concerns and latest trends affecting homeowners and those aspiring to own. Here are the results. Public confidence in the housing market is bouncing back, according to the 2015 Homeowner Survey, conducted by the HomeOwners Alliance, myhomemove and BLP Insurance. 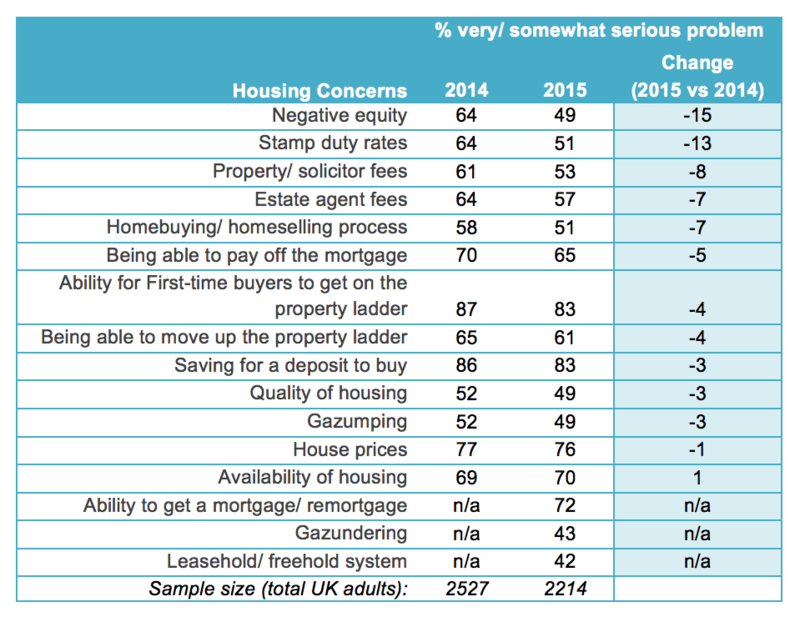 People’s concerns about housing have receded ‘across the board’ over the last year. Most dramatically, the numbers saying that negative equity is a problem has slumped in the last 12 months by more than 10%. Concerns about stamp duty rates have seen a near identical drop. 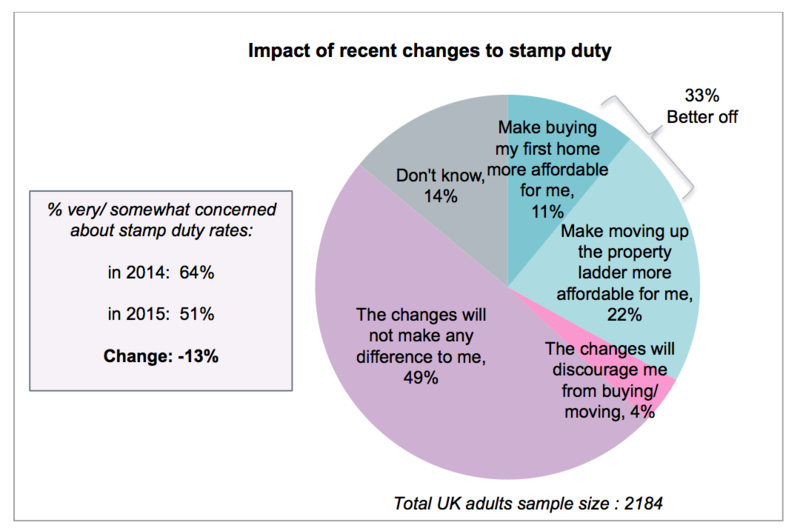 The proportion of adults who say stamp duty is a serious problem has dropped from 64% in 2014 to 51% in 2015. In the wake of the government’s reforms of the system last year, one third say they feel the recent changes to stamp duty have made it more affordable for them to buy their first home or to move up the property ladder. The HomeOwners Alliance campaigned strongly for reform of the stamp duty system, and welcomed the reduction in rates at the lower end of the housing market and abolition of the hated “slab” system. Concerns about estate agent fees, conveyancers’ fees and being able to pay off the mortgage have all eased over the past year. Yet the ability for aspiring first-time buyers to get on the property ladder continues to be a top housing concern with 83% of UK adults saying it is a serious problem. 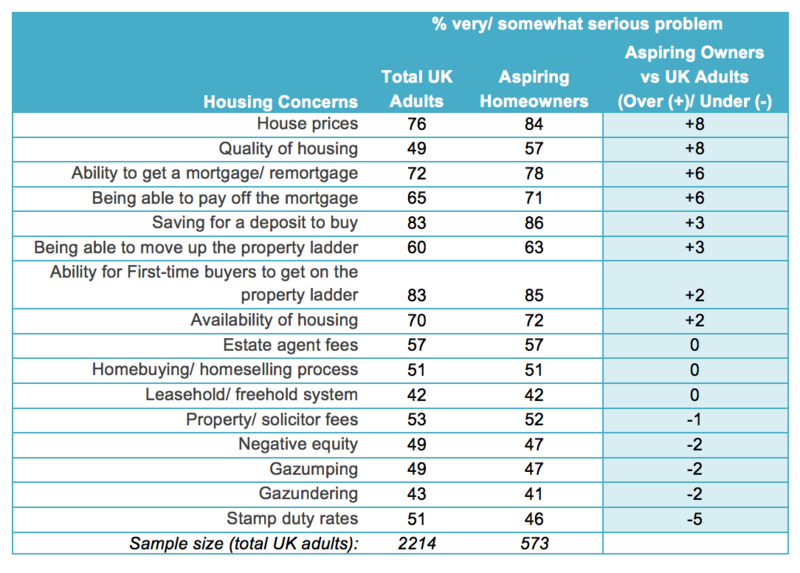 Among those aspiring to get on the ladder, house prices, saving for a deposit, the ability to get a mortgage/remortgage and quality of housing are rated as more significant issues than among UK adults generally. The proportion of adults who say negative equity is a serious problem has dropped down to 49% from 64% last year; after a steady increase in house prices. Negative equity continues to be a key concern in Northern Ireland, with 68% saying it is a serious problem. Housing anxiety overall has subsided, with UK adults saying they are less concerned than last year across the board, including property/solicitor fees, and the quality of housing. Concern over stamp duty rates has also fallen sharply (64% in 2014 to 51% in 2015), with 1 in 3 saying that the recent changes to stamp duty have made it more affordable for them to buy their first home or move up the property ladder. Aspiration to own your own home has edged up slightly, with 69% wanting to own, compared to 68% last year and 65% in January 2013. Aspiring homeowners are significantly more concerned than UK adults, with house prices (84% vs 76%) and the quality of housing (57% vs 49%). Regionally, concern about high house prices continues to be greater in London than in other regions. (60% of Londoners say house prices are a very serious problem compared with 40% in the UK generally). The proportion saying house prices are a very serious problem in London has risen 5% in the past year. 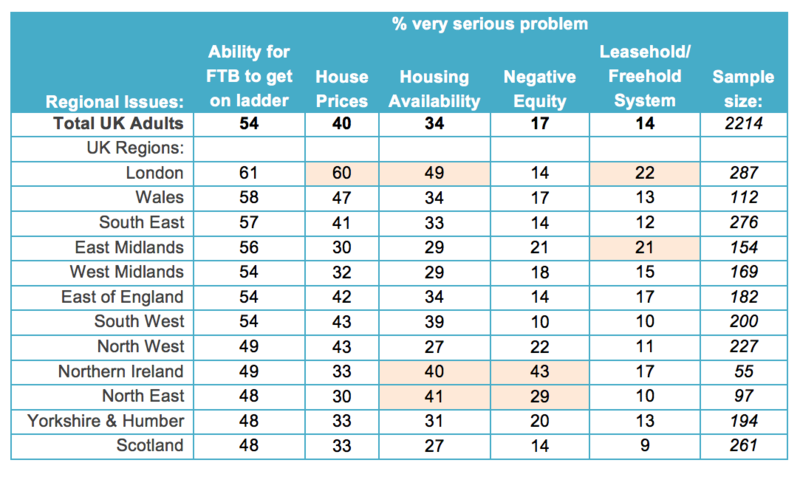 Those living in Northern Ireland and the North East are more concerned with housing availability and negative equity than elsewhere in the UK. The leasehold and freehold system is causing widespread concern across the UK, with 42% of adults saying it is a serious problem. In London, East Midlands and East of England, around half of people say it is a serious problem. “It is very encouraging that concerns about stamp duty and negative equity have fallen so sharply over the last year. But 83% of us continue to worry about prospects for first time buyers. Recent announcements about building new homes and Help to Buy ISAs are all welcome offers from politicians vying for our votes. But in a UK with low wage growth, high house prices, and the current lending criteria constraining aspirations to buy a home, we still have a long way to go to turn around the decline in homeownership. Every year the number of aspiring homeowners grows – while the rate of quality housing being built in the right place at the right price falls well short. “The reduced level of concern over Stamp Duty is welcome news to many within the property market. Our clients would have saved £51 million if the reforms had been introduced two years early – the reason why we have been lobbying for change. 1. All figures in the 2015 Homeowner Survey, unless otherwise stated, are from YouGov Plc. In 2015, total sample size was 2,214 adults of which1,390 were Homeowners. Fieldwork was undertaken 4-5th March 2015. The survey was carried out online. The figures have been weighted and are representative of all UK adults (aged 18+). 2. The Stamp duty question was asked to the political You Gov panel. Total sample size was 2,184 adults. Fieldwork was undertaken between 6th – 9th March 2015. The survey was carried out online. The figures have been weighted and are representative of all GB adults (aged 18+). 3. 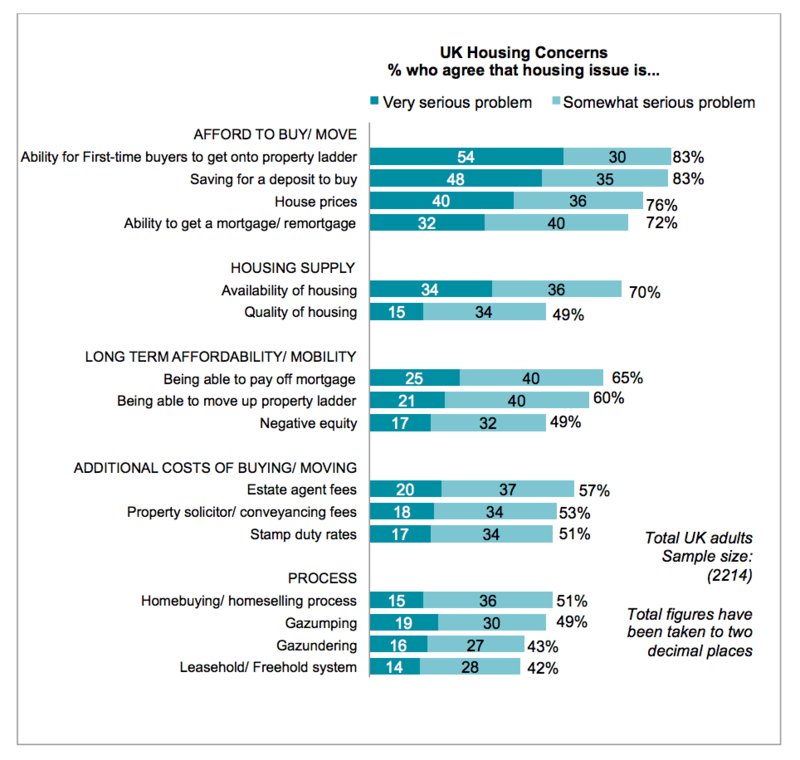 We reported last week the difficulty of getting a mortgage/remortgage as a big housing concerns amongst UK adults, with more than 7 out of 10 saying it is a serious problem. 4. The 2015 Homeowner survey was made possible through sponsorship by BLP Insurance, leading provider of housing warranty insurance, myhomemove, the UK’s leading conveyancing provider and TrustMark, the Government endorsed ‘find a tradesman’ scheme. The HomeOwners Alliance champions the interests of Britain’s homeowners and aspiring homeowners. We are a consumer group providing helpful advice and services and acting as the voice of the homeowner in the media, lobbying for their interests in government, and campaigning against bad practices in industry. We believe we are Britain’s most popular and fastest growing property advice website, staying true to our mission to help homeowners facing some of the biggest and most complex decisions of their lives. Last year, more than 1.5 million homeowners and aspiring homeowners visited our website, hoa.org.uk, viewing over 2.5 million pages. At hoa.org.uk, we provide independent advice for the key moments in owning a home, supported by legal and industry experts. Get our free newsletter with a market-wide view of house prices and all the latest tips on buying, selling, improving and managing homes. On our website you can find free independent guides, checklists and top tips. Specialising in the residential sector, myhomemove offers straight-forward, innovative solutions for conveyancing. Through its wholly-owned subsidiary, Premier Property Lawyers (the UK’s first ABS law firm and the largest provider of mover conveyancing services), myhomemove helped over 40,000 buy and sell their properties in 2014. The use of advanced technology ensures that the process of moving home is managed accurately and at an affordable cost. myhomemove is dedicated to providing a superior level of service, with a focus on speed and professionalism. BLP Insurance offers housing warranty insurance and commercial development latent defects insurance underwritten by Allianz Global Corporate & Specialty SE. Our insurance is a compelling alternative to the ‘traditional’ 10 year new home warranty solutions and our commercial latent defects insurance product is the most comprehensive in the market. Unlike traditional new homes warranties, BLP’s insurance covers the building – not the developer – and does not ask developers to pay up front registration fees, ongoing membership fees, bonds, guarantees or deposits. For claims, only proof of damage is required not proof of liability. BLP’s cover is approved by all of the major British mortgage lenders. We provide peace of mind for homeowners and protect their investment from the risk of undiscovered defects, because: our insurance policies are backed by an AA rated global insurer; we will have properly assessed the build project from design through to workmanship on site, to help minimise the chance of future defects; and if a defect does arise the homeowner won’t have to prove who is to blame, just that there is a defect.